Back in Berlin after break (wedding and honeymoon), to discover that it’s very warm. Tried to sit down with Aldo Rossi’s Architecture of the City, but kept nodding off. Newspapers filled only with yesterday’s Germany/Argentina game. So having failed to read anything, thought I’d write about some books instead – one in particular, followed by a fairly random list of Berlin architecture-related things that I’ve been reading, as I thought you might be interested. This all stems from my guilt at not having reviewed Berlin Urban Design: A Brief History, sent to me by Dom publishers a little while back. I was surprised to be sent further books by them, as I was lukewarm about the previous one. But this new publication is much more to my liking; a breezy canter through Berlin’s urban planning history, from its military and industrial roots up to the present day. It’s an easy read (despite a few awkward english translation moments) and a good short guide for anyone wanting a grounding in the subject. 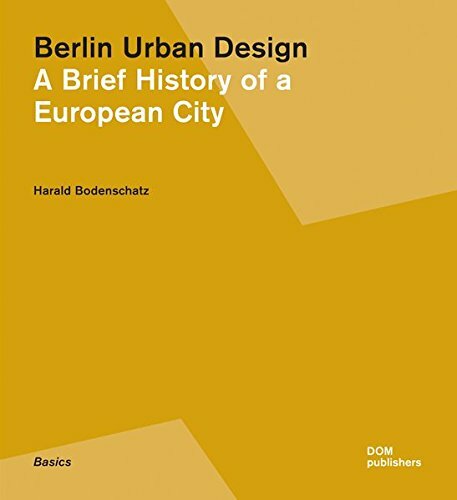 The introduction makes the point that Berlin is very much a 19th and 20th century city. Minimal page space is given to the medieval and Baroque periods, since, despite the Berlin government’s tourist-friendly focus on rebuilding a Baroque castle and other such retro weirdness, these periods do not dominate the capital’s dominant urban history. Rather; between 1871 and 1918, it was the largest industrial city in Europe – something that you’re constantly reminded as you explore the eastern part of the city along the Spree, where Berlin’s monumental industrial remains are only slowly giving way to the offices and apartments of the ‘creative class’ (I hate this term, but as its use becomes increasingly pejorative, I use it more and more. It’s a phrase that makes you shudder, much like ‘World Class’). And important to remember also, as you cycle back late from a friend’s place out at Stralau, that these buildings existed for a purpose other than venues for dimly lit but achingly seductive techno parties. Anyway, back at the book: the Hobrecht Plan of the 1860’s is compared in some detail with Haussmann’s Paris and Cerdà’s Barcelona projects of the same period, mounting a partial defense of Hobrecht by pointing out that the creation of high density slums was not directly the fault of the plan, which simply laid down street and overall block sizes. It did not regulate the number or quality of buildings per block, although perhaps this omission is in itself a failure on the part of the planning authorities – having been staying in Barcelona’s Eixample only days ago, it’s hard not to see the latter as far superior to the former. Greatest depth is allocated to post-Wall planning, to which I haven’t really paid much attention to be honest, save for the odd critical sneer, due to my personal obsession with the late 1970s and early 1980s and the seemingly general agreement that since the wall came down all development has been poorly planned and dominated by commercial interests. Worth noting though that there is more to Berlin’s current plans than neverending gentrification, even if it often seems that way. But most interesting to me was mention of the ‘pilot projects’ for the IBA housing exhibition of the 1980s, which the author sets out clearly as a turn away from modernism, in terms of urban development. These included “Block 118” – careful urban renewal of existing buildings at Klausener Platz, Charlottenburg, as well as similar planning around Chammissoplatz in Kreuzberg. Berlin Urban design – A Brief History. By Harald Bodenschatz, Dom Publishers. English and German (link is to English). 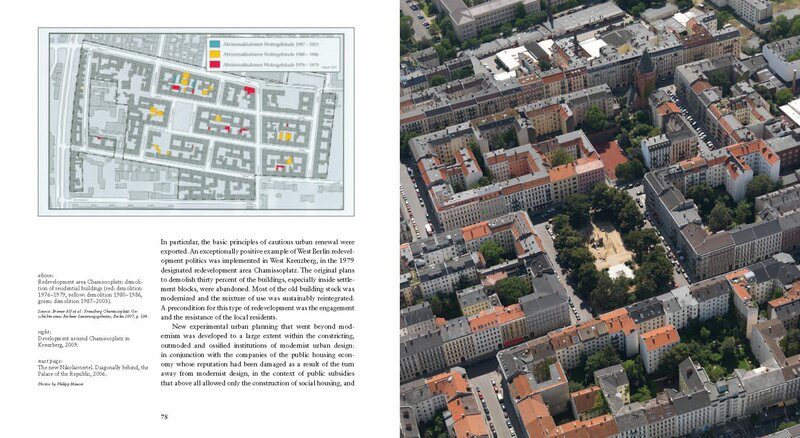 Traces of Terror: Sites of Nazi Tyranny in Berlin – not for sad ‘obsessed with Nazis’ types, but a sober reflection on sites rather than just buildings. including the Britz ‘Horsehoe’ estate. Braun are a pretty big publisher of all things Berlin architectural, including the essential, I-never-leave-home-without-it, Berlin Architekturstadtplan (Architecture City Map), the Berlin Architecture Guide and also the annual guide to new architecture in Berlin. Deutschlandscape/Deutschlandschaft – Epicentres at the Periphery. A book produced from Germany’s pavilion at the 2004 Venice Biennale, covering Berlin and elsewhere. Mainly elsewhere. Where it turns out there is much more interesting new architecture than in Berlin itself. Modern Architecture In Berlin – an excellent guide by architect Rolf Rave, with a selection of 466 buildings, covered ‘briefly but informatively’, as they say, and available in all good bookshops. The kind of book that I like to flick through endlessly, frequently annoying my wife by saying “oh that’s who did that building”. A Life In Cities – autobiography by David Mackay, of Catalan architects MBM, whose work includes masterplanning the Barcelona Olympics, and Berlin projects including IBA buildings on Kochstrasse. He graduated from the AA in London in the early 1950s and moved to Barcelona with his new catalan wife directly afterwards. A fascinating mix of personal reminiscence and commentary on cities and architecture. I notice Scotland’s RIAS, who published it, are doing them for £15 at the moment. And my current favourite: “The Language of Postmodernism“, fourth edition, by Charles Jencks. Often unintentionally amusing (this edition is from 1987, when Postmodernism was seen as the only possible future after the death of modernism) but equally as often intentionally amusing, wry and intelligent. Found it in a secondhand bookshop, am sure you can find a copy somewhere on the web if you need one. A much later edition, which must have been losing its point somewhat, is available. There’s lots more, but books are all in teetering stacks around the place and thus a bit confused at the moment.